fjean has no other items for sale. *$80 for 24 months. Minimum purchase required. 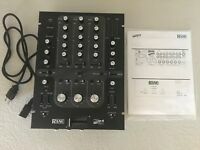 vestax pmc 46 mk 2 house Mixer UREI Very Rare Good condition From Japan F/S!